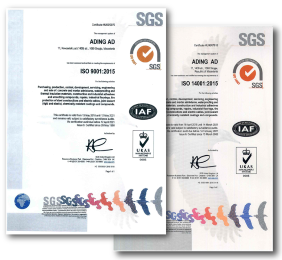 All processes of certification and recertification have been performed by SGS Yarsley Certification Services LTD, United Kingdom. ADING AD has implemented quality management system since 1998. The long-term successful management, planning, control and quality assurance with continual improvement of wishes and trust of interested parties, contributed for the company to become leader between global competition and proved that the company is capable to produce high grade products and offer high grade services. The top management of ADING AD defines the quality policy with understandable vision, unambiguous mission and strategy for their implementation with the only aim for continual improvement of beneficiaries requirements and wishes, advancement of products quality, gaining of new products ,new markets, introduction of new technologies and expert advancement of employees. The top management is responsible for persistent carrying out of defined aims in the quality policy and its realization where are included all employees of ADING AD. Quality operation system in our company means unique Management system according to requirements of ISO standards 9001:2000 and 14001:2004. That is expressed by Quality policy and environment protection policy. With environment protection policy are acquainted all interested parties and employees in the company as well as the suppliers and consumers. The company operates ecological and takes care for its employees and also for surrounding, so it best contributes in environment protection and its mediums against harmful effects during doing of every day activities in technological processes. In the policy for environment protection are transformed all requirements of standard ISO 14001:2004 which are practiced wholly so we maintain system management with environment confirmed with certificate by SGS Certification services. 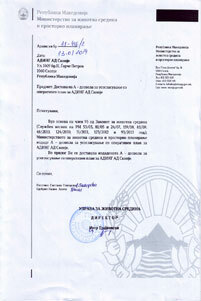 On 13.01.2014 ADING obtained an A – license for integration with an operational plan, issued by the Ministry of Environment and Physical Planning of the Republic of Macedonia. The A – integrated environmental license was issued as a result of the development and the modernization of the production process, as well as due to the application of the strict standards of environment protection that are compatible to the standards of the European Union.